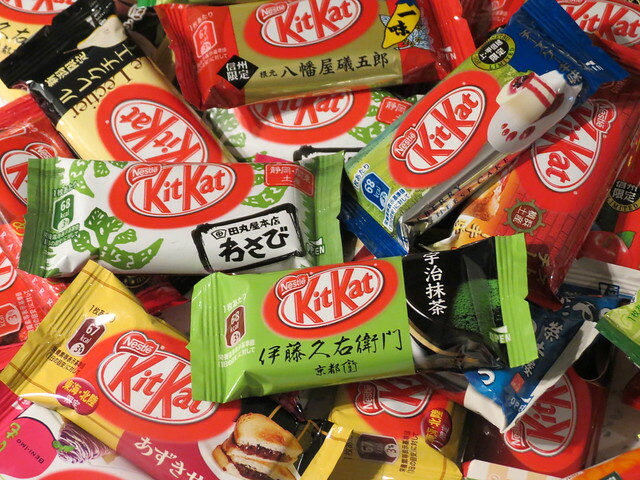 As some of you will know, I’m a bit of a Kit Kat ‘otaku’ (obsessive fan). 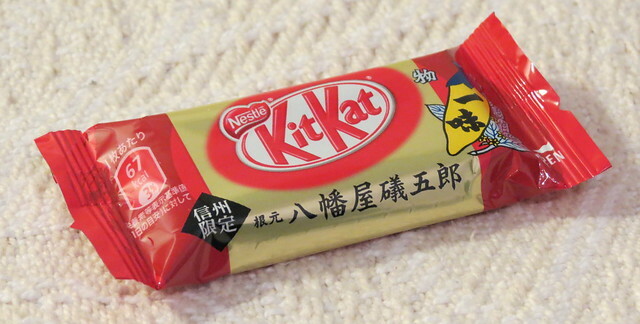 I even have a separate blog for Kit Kats (Kit Kats! 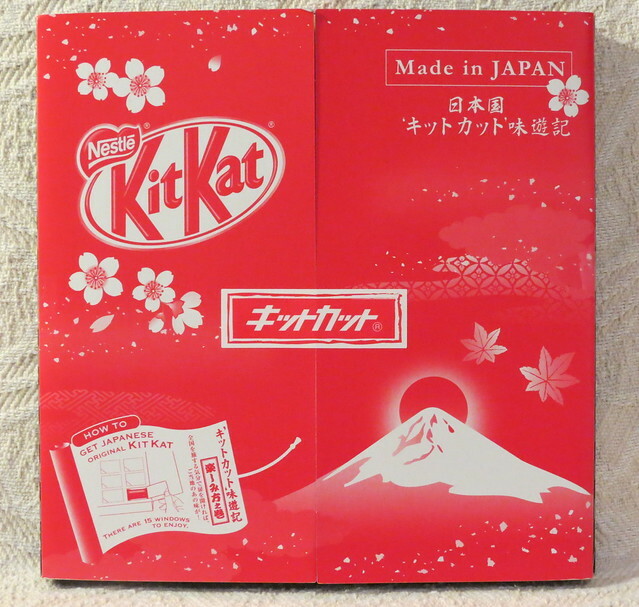 ), which was initially a page about Japanese Kit Kats on this blog but, when it grew too large, it became a blog about Kit Kats from all over the world (which is generally the UK and Japan, but other countries too when I get the chance to sample their wares). 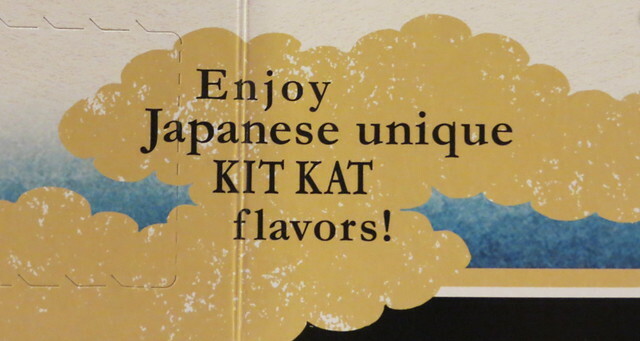 So what’s so special about Japanese Kit Kats? 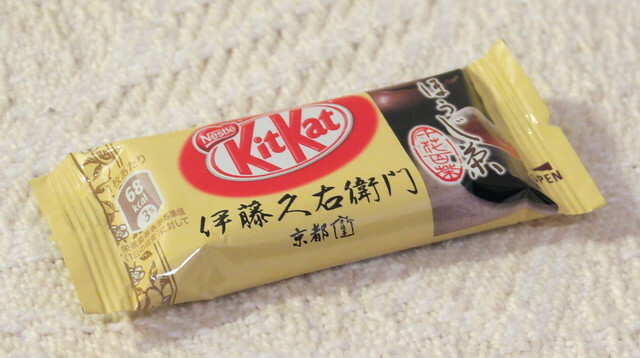 Well, due to the fact that ‘Kit Kat’ in Japanese (キットカット / kitto katto) sounds like the phrase きっとかつ / kitto katsu, meaning ‘you will surely win’, Kit Kats have become pretty popular in Japan. Apparently it started out with mothers putting Kit Kats in their children’s lunch boxes to wish them luck with exams, but at some point Nestle got a hold of the idea and marketed the hell out of it. 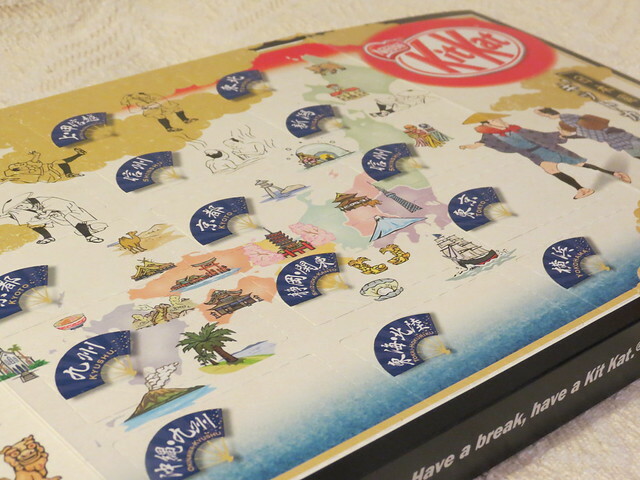 Now there are Kit Kats for just about every region of Japan, seasonal flavours, special packs you can post, and all sorts of other items. 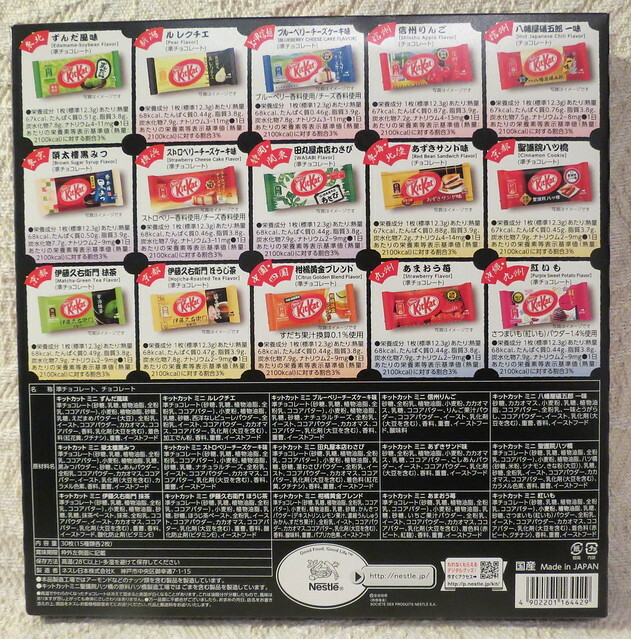 Earlier this year I became aware of a new Kit Kat collection which seemed to be the holy grail of Japanese Kit Kats: the Japanese Kit Kats – Regional Collection (日本国キットカット味遊記) – a special pack containing 15 different flavours from around Japan. To be honest, I had tried all but two of the flavours, but it was the packaging which had caught my attention. I had never seen something so beautiful… and I had to have it! The box has a graphic explaining that it is designed like an advent calendar with 15 windows. 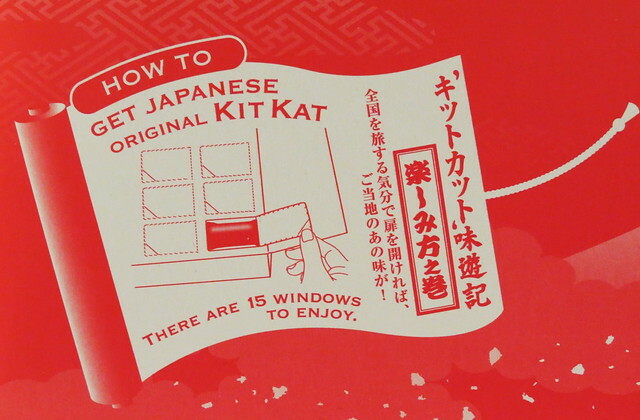 Behind each window you’ll find two Kit Kats. Taking the sticker off the front to open it up felt somehow wrong – I almost wanted to keep it preserved forever! On the back of the box, all of the flavours are listed. 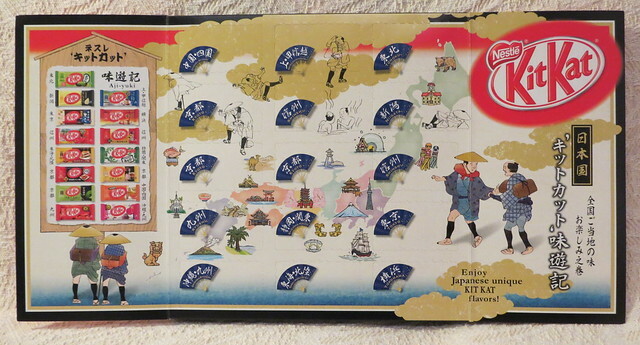 It’s worth noting that the English on the box is simplified and, if you can read Japanese, you’ll find out more about the Kit Kats and the regions they’re from. I wish I could read more Japanese, but there’s a lot of complicated kanji on the box. Still, I’ve done my best to translate the flavours as accurately as I can later on in this post. 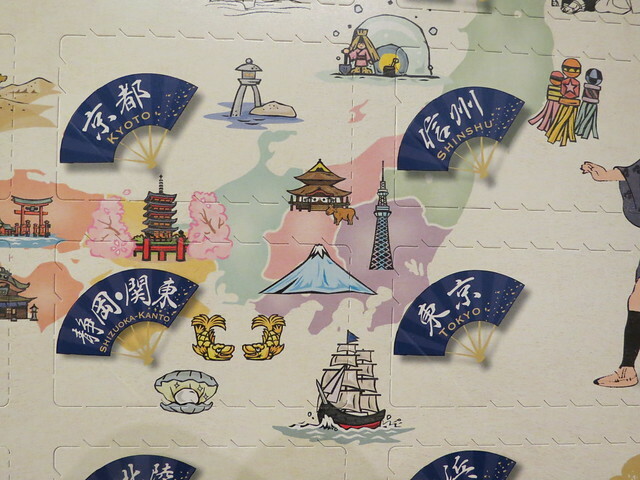 All of the region names are written on the blue fans, and dotted all over the map are images to illustrate the famous landmarks of the different areas, as well as amusing characters. One thing that really struck me was the type of design used – it seems to be based on Japanese folding screens, and the gold clouds around the edges reminded me in particular of the talk I went to recently about the stage design for the play Anjin. The director of the play had also been inspired by these gold clouds on folding screens. This one tastes quite ‘beany’, and is certainly a unique flavour. I hadn’t heard of ‘zunda’ before I first came across this Kit Kat, but basically it is mashed up, unroasted, sweetened soy beans. Apparently it’s as popular in the Tohoku region as red bean paste (anko) is in Nagoya. This was one of the new ones for me, and I quite liked it (although it’s not in my top 10). It’s quite sweet, and has a very distinct whiff of pear about it. 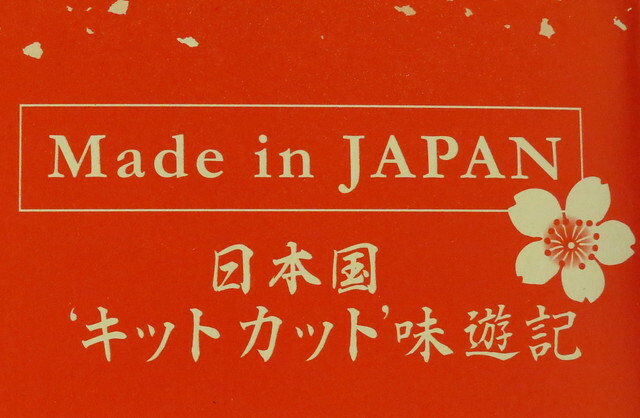 I hadn’t heard of Le Lectier pears before, so I Googled and discovered that they were imported from France to Niigata Prefecture, Japan, in the early 20th century, and have been associated with the region ever since. 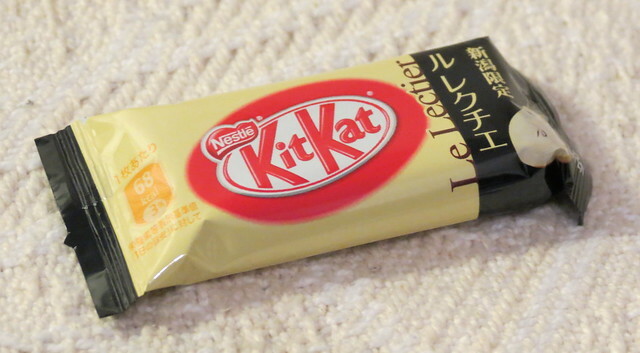 This is such a good flavour for a Kit Kat! I’ll always remember the first time I tried these ones, when a student gave them to me as a present after a trip to Nagano. ‘Shinshu’ is actually one of the old names for what we now think of as ‘Nagano Prefecture’. However, the name has been kept when referring to the apples from that region. 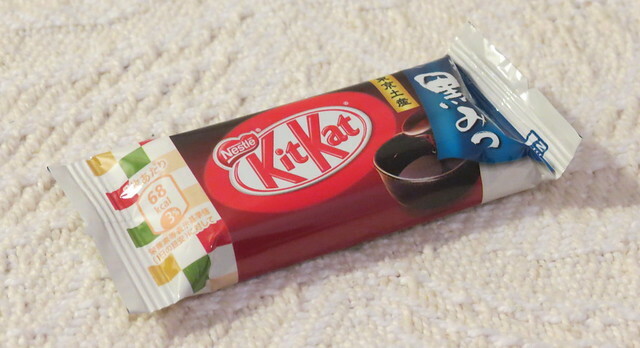 I love chili chocolate, and this is probably one of my favourite Kit Kats. I always thought it was just ‘Ichimi Kit Kat’ but, when I looked at the name more closely today I noticed that it is actually ‘Yawataya Isogoro Ichimi’. I searched for ‘Yawataya Isogoro‘ to find out what it was, and it seems to be a company which produces and sells Japanese chilis and spices. This is one of the very ‘Japanese’ flavours in the box, and I always find it hard to explain to people what ‘kuro mitsu’ is. It could be likened to treacle, but it’s runnier, and I think tastier too. Strawberry cheesecake seems like quite a standard flavour compared to some of the others, but it’s still miles better than anything we can get in the UK. Ah… wasabi. 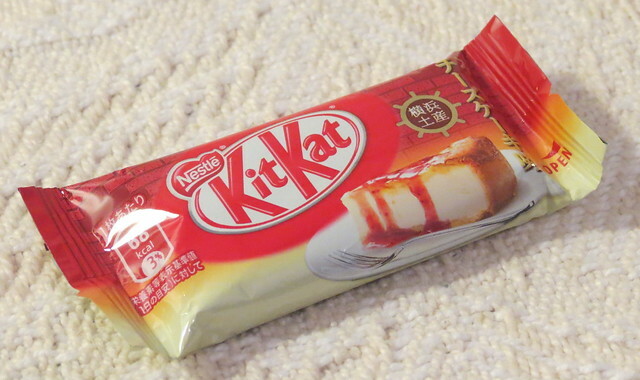 This is one of the Kit Kats that gets Japan its name for producing ‘weird food’. However, most people accept chili chocolate nowadays, so what’s so different? 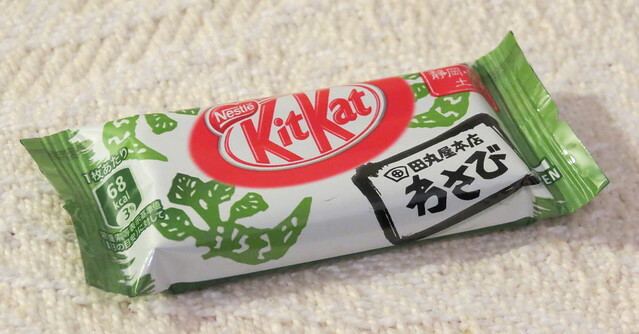 Wasabi chocolate (if you like wasabi of course!) is really tasty – give it a try! Incidentally, this wasabi Kit Kat is labelled with ‘Tamaru ya‘, which seems to be the name of a a wasabi producing company. Red bean sandwiches make me feel nostalgic about Nagoya, as they’re popular there. I couldn’t even tell you how many of these particular Kit Kats I’ve eaten in the past! Oops. This Shogoin Yatsuhashi Kit Kat was the one I was really waiting for – a truly Japanese flavour which I had never had the chance to try before. Anyone who has ever visited Kyoto should know what ‘yatsuhashi’ is – it’s the most popular traditional food souvenir, which tastes of cinnamon. 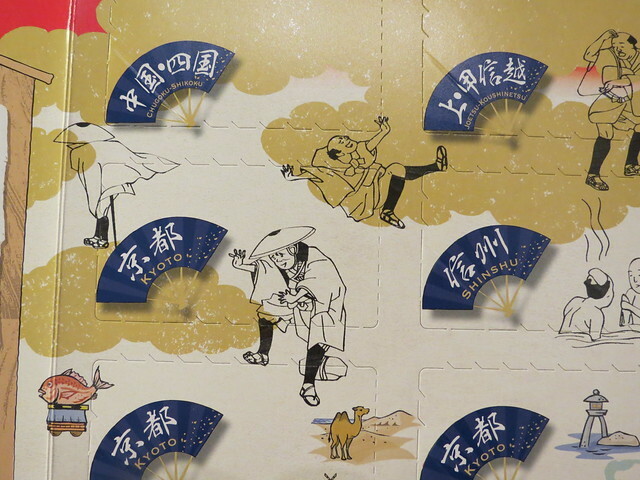 In the picture above, you can see these wafer-like things – they’re yatsuhashi. Yatsuhashi, named after a Japanese musician called Kengyo Yatsuhashi in 1689, used to be sold on the approach to a temple called Shogoin, and got the nickname ‘Shogoin Yatsuhashi’. 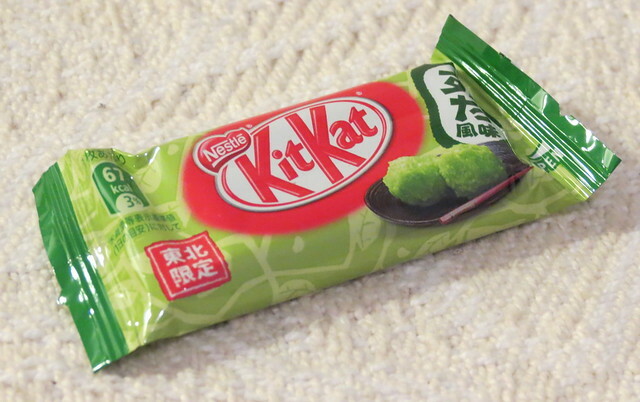 Matcha – green tea – Kit Kat is the classic Japanese Kit Kat now, and even that comes in different varieties. This one, like the hojicha one below, is labelled ‘Itokyuemon‘, which seems to be the name of a tea shop or company in Uji City, Kyoto. 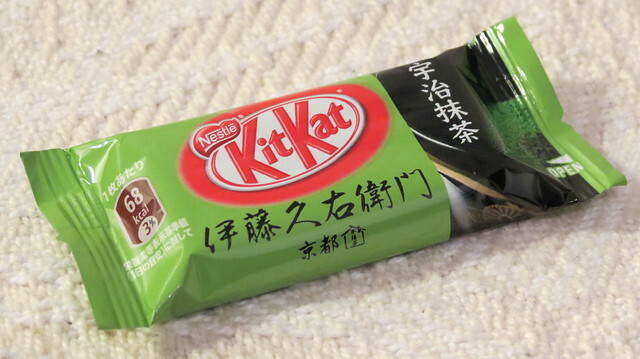 Just like the matcha Kit Kat above, this hojicha Kit Kat is a classic from Kyoto. 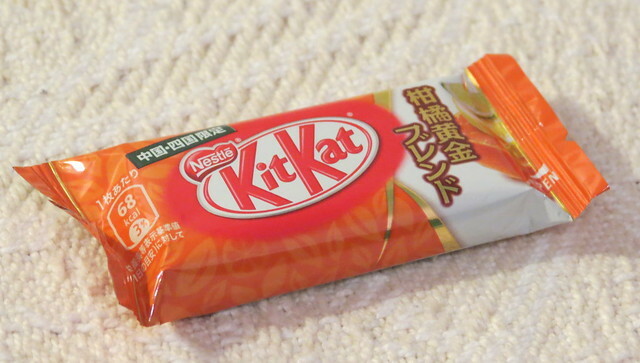 These citrus Kit Kats are really fruity and zingy, and I’m sure they’d sell well in the UK if only someone would try. You can’t beat a strawberry Kit Kat – the chocolate is pink and it smells like bubblegum. 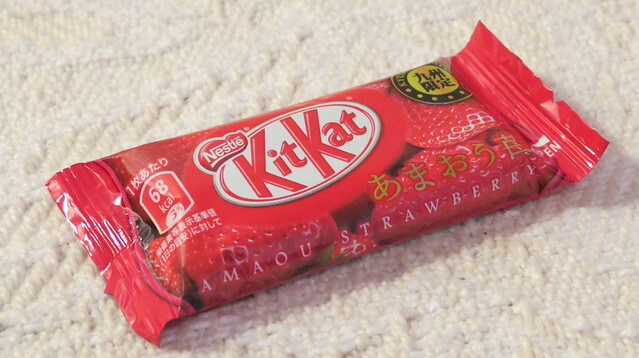 Amaou, by the way, is the name of a place in Fukuoka where strawberries are produced. 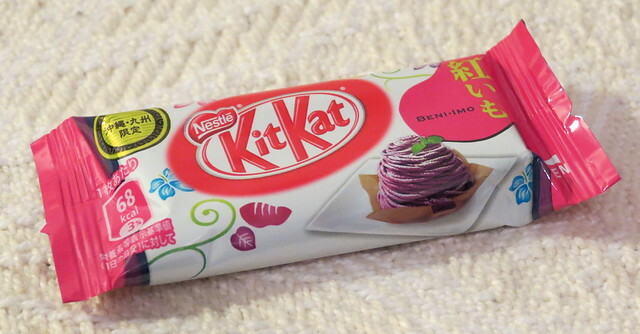 Beni imo – purple sweet potato – is a classic Okinawan flavour and, although it might look a bit strange, I highly recommend giving this purple Kit Kat a try! If you get the chance, do try some! I’m sure there must be a flavour suitable for everyone, and the 15 flavours listed above only just scratch the surface of what is actually available if you travel around Japan. Wow! OMG! I want that! I think I’ve tried almost all of the KitKat you listed here already (after all I’ve been to all 47 prefectures in Japan and usually I buy the KitKat version of each region). Yet I’d love to get this “all-in-one” box! Must try them all, you’ve made me so happy with this post! Wow! Fab set of photos!!! Thanks! I spent… a-hem… hours photographing Kit Kats this week! LOL! Wonderful article and makes me want to try several. 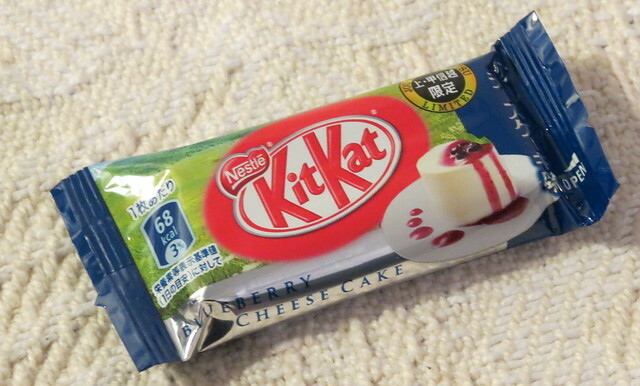 I had the pleasure of tasting a strawberry cheesecake KitKat which a friend of mine gave to me and I finally found out what my mouth is for. The taste is somewhat sweet and slightly taut with berry goodness, this led me to believe life cannot gt any better. 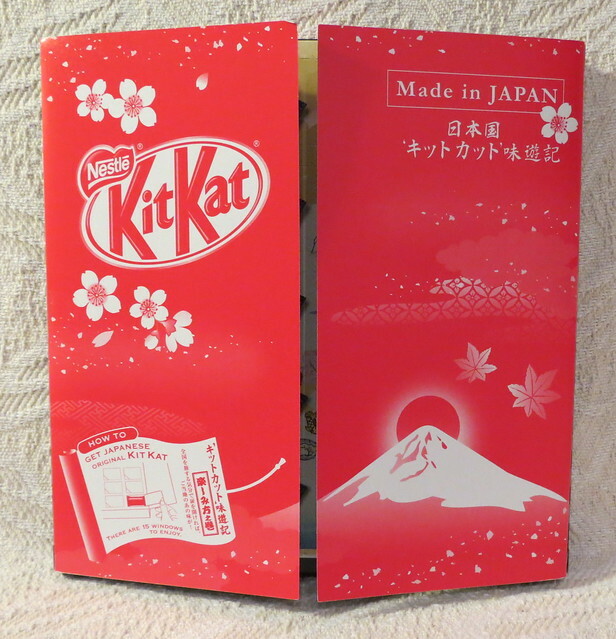 You should ask people from Japan to send you KItKats in return for autographs and pictures of you eating what they send! Love the Kit Kat!! IIII haha! On every trip through Narita, my mother and I make sure to buy the KitKats! I have a fondness for the kinako ones myself, but I’m a kinako fanatic. ^_^ I want to try a bunch listed here I haven’t yet already! Glad to know you finally got what you wanted so much! 🙂 All flavor looks very yummy. 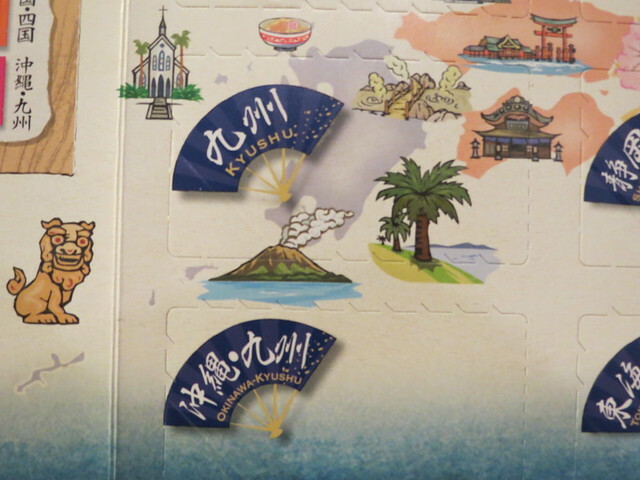 I am going to Japan in April so hope I can eat some of them! I saw you in japanese TV yesterday! Your okonomiyaki looked good! by the way,Tonight broadcasted about this brog at NHK(Nihon Housou Kyoukai). So,I interested about you and your brog! 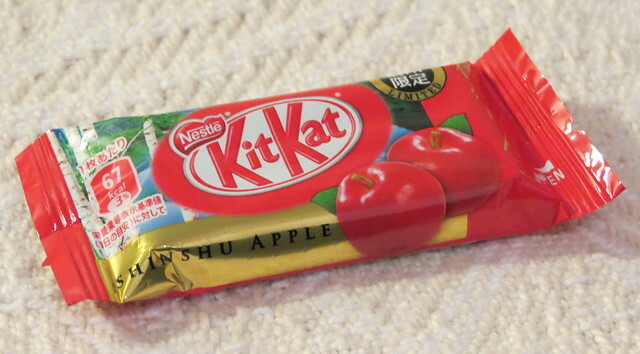 I did not know that even Japanese Kit Kat. Especially want to eat the wasabi taste! I will also read past articles! 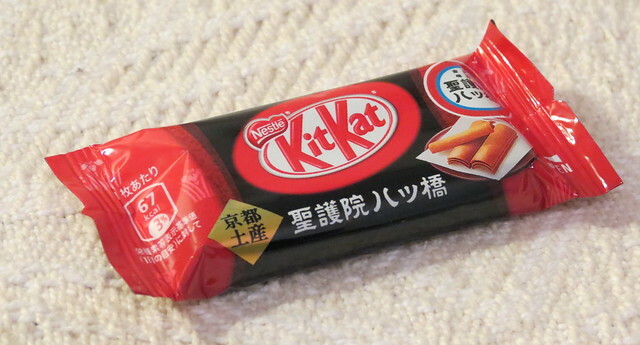 Please try Japanese Kit Kats – they’re really good! Wasabi Kit Kats are excellent!